In a follow-up on Alon’s Casio factory visit last month, I got presented the honor of interviewing Mr. Etsuro Nakajima by email. 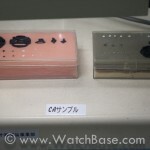 Nakajima-san spent an impressive 39 years at Casio, starting only a few years after the release of the original CASIOTRON watch, only to celebrate his last day the very day he and Alon met – his last function at Casio being Senior Manager of the Module Development Department at the Timepiece Devision. After a well-deserved holiday with his family, Nakajima-san now serves as Representative Director of The Horological Institute of Japan. I think you can imagine I was very curious to hear about his career and his view on watches! Nakajima-san, I was told you worked at Casio for a staggering 39 years. Can you tell me a little bit about how you first got to work with the company? Right after I graduated from university, I entered Casio. 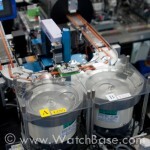 I started my career as a watch module engineer. 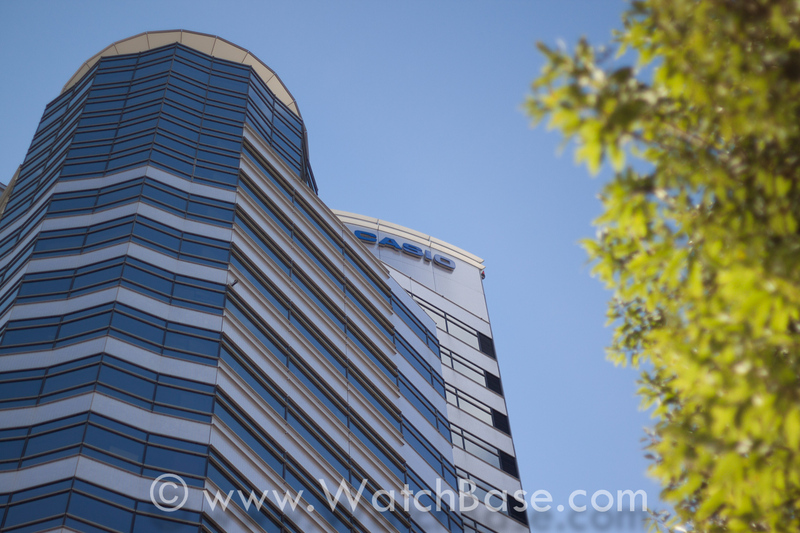 Can you tell us a bit about the various positions you have had at Casio? 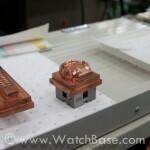 After two years of experience as a watch module engineer, I moved to the planning group, then went to US office in NJ to work as a planner. I proposed the idea of the running watch to R&D in Tokyo , then came up with the first runner’s watch with lap timer function. 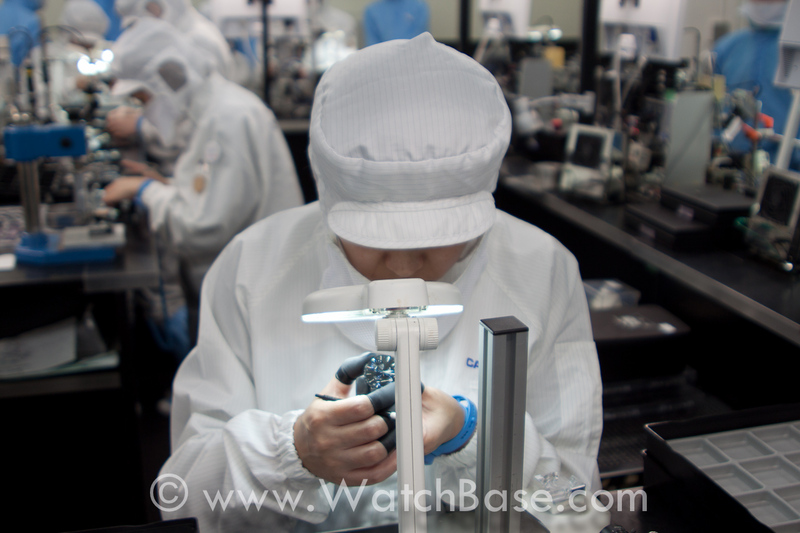 I spent almost two years in US, and since then I was involved in a planning for both watch modules and watch brands for 35 years in Japan. What was it in watches that drew your attention? All factors such as brand, design, technology, material, and of course price. I believe that they will be the same for all customers, but only the ratio is different. Can you tell us about some of the projects you have worked on? An altimeter and depth meter watch in 1986, first radio control watch for Casio in 1994, easy touch series in 1995, radio control watch for China market in 2007, bluetooth low energy watch in 2012, and lots and lots of failed projects. The projects such as altimeter using low power sensor which lead to the creation of brand called PROTREK, and radio control technology which resulted in the brand creation of OCEANUS. 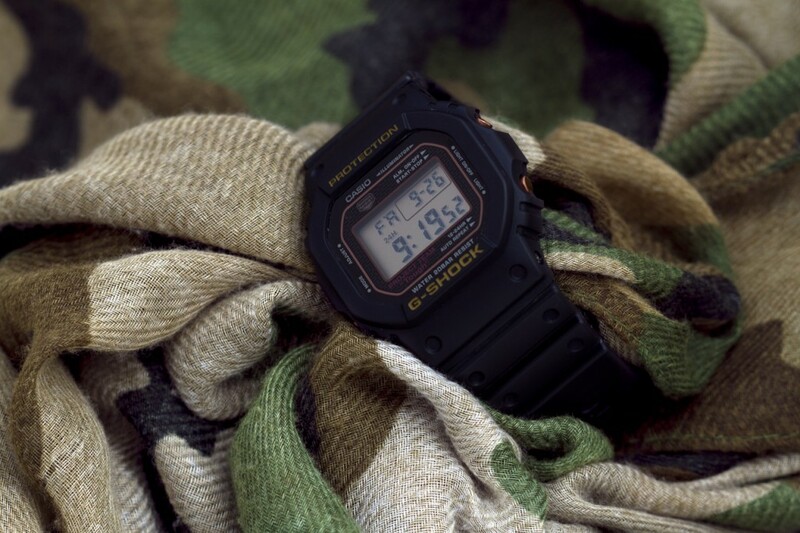 We have proved within Casio that the key technology has been used to strengthen the existing brands such as G-SHOCK, but also could be the core value for new brands. Last week you celebrated your last day at Casio. What made you stop after all this time? I decided to leave Casio because I thought it would be easier for younger generation to work freely, though I had three more years to retire at age 65. I had a feeling that I have done what I had to do at Casio. Can you tell us a little bit about your personal watch collection? I do not have a big collection of watches. Only a few pieces. That’s interesting.. so what is the watch you wear most? Right now, I wear OCEANUS OCW-G1100 special version with my name and the date of my last day engraved. 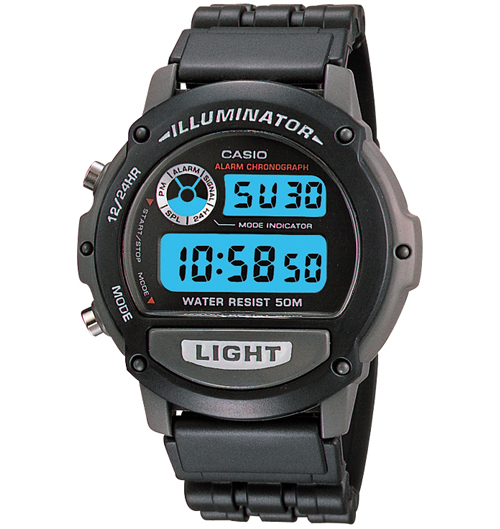 What is your favorite Casio watch? The W87 leather strap version. What would you consider to be your ‘dream’ watch, if money were no object? Either a mechanical or electronic watch which lasts for more than 100 years with no maintenance to be worn by generations. I have to ask: the Apple Watch. What is your opinion? This is my personal view; Apple watch will be successful in 2-3 years and will become a number one watch brand in the world in sales amount. But I assume that the sales of Apple watch is not a main goal for them, they are trying to capture the big data for payment and health or other personal info which is not that easy now. I guess that Google is in the same game. 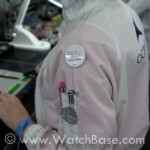 Do you think it will change the horological landscape like quartz did? 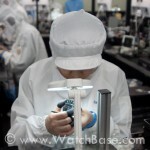 I heard years ago that it will change the watch distribution, it is a revolution of the watch industry. We all remember what happened to CD shops in the past. We buy songs through online store now. 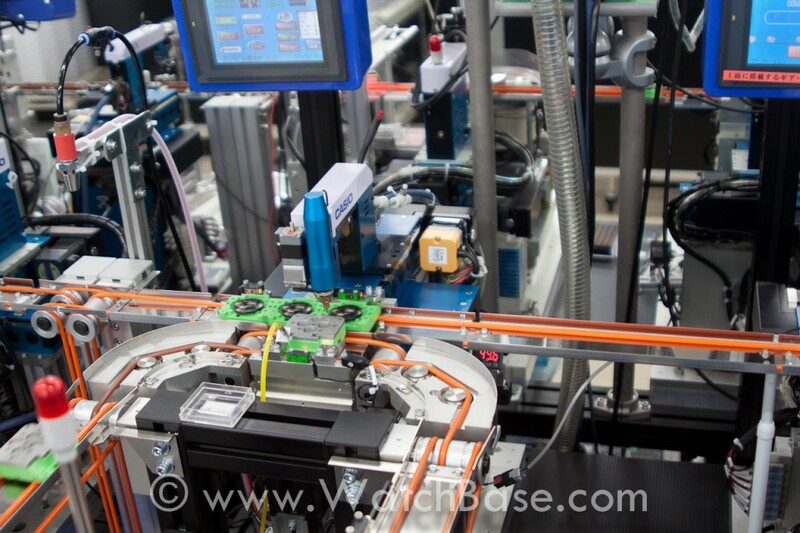 This could happen to watch industry in a smaller scale. Because there are still millions of customers who want to buy Swiss brand or non smart watch brand at the watch stores, the impact of Apple watch may be marginal. We understand you will now be joining the Horological Institute of Japan. Can you tell us a little bit about this institute? What are its objectives? I work as Representative Director at Horological Institute of Japan since the beginning of 2015. 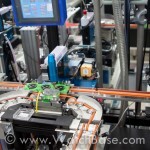 We have some annual event such as Micromechatronics Annual Meeting, Inspection tour, and workshops. 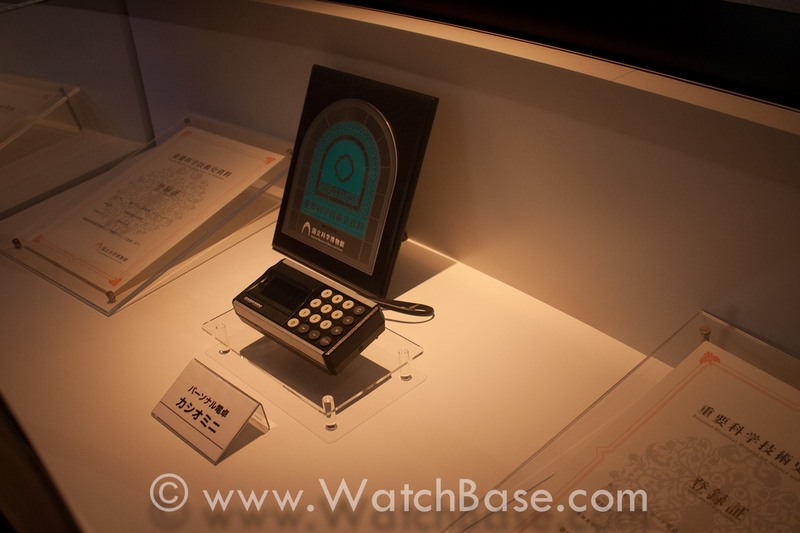 The Horological Institute of Japan has a long history. It has been a place for an exchange of technical ideas among members from timepiece industry and those who are engaged in its applied technology. The members from both watch industry and universities have been primarily engaging the activities for survey or research on timepiece and its technology at the Horological Institute of Japan. 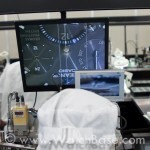 We are open not only to watch and clock manufacturers or universities, but to the parts or device makers, timepiece distributors, after sales service industry, and all other interested parties. What will be your position at the Horological Institute of Japan? 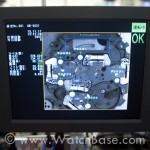 Do you see any major differences in watch buying & collecting in Japan versus other parts of the world? I do not know much about the difference in watch collecting or the collection itself, but buying should be definitely different depending on where you are. 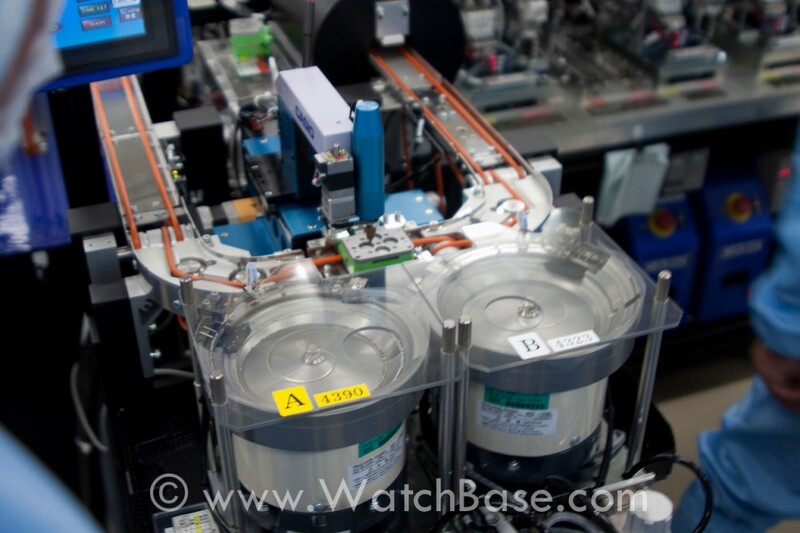 How do you see the future of digital & high-tech watches? 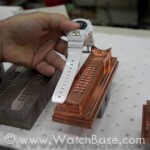 Since Casio started a watch business with digital model in 1974, world market share of digital watch remained the same. 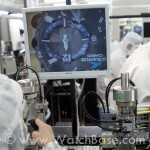 I believe there will be a certain market for more advanced digital watch with better display and other values. When I am running, I prefer to wear digital watch with connecting feature with iPhone. It is easy to read pace, distance, heart rate, on digital display. 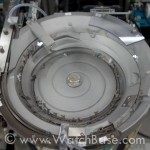 High-end watchmaking is very much focused on mechanical movements. Do you think Casio should venture into this area? Last but not least: Do you have any insiders-tips on new Japanese watchmakers and watch brands we should be keeping an eye on? 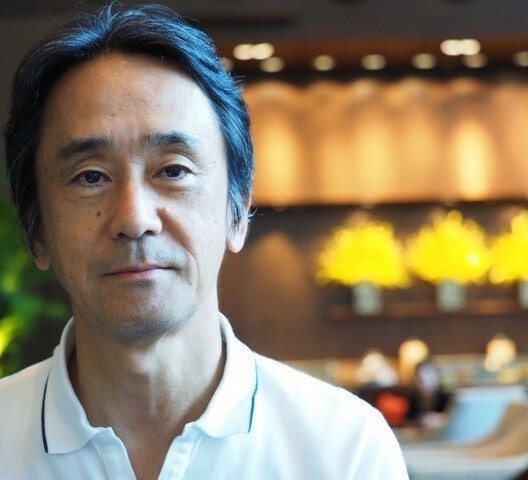 I would like to thank Nakajima-san for answering the questions we cooked up. Best of luck on your new endeavor! 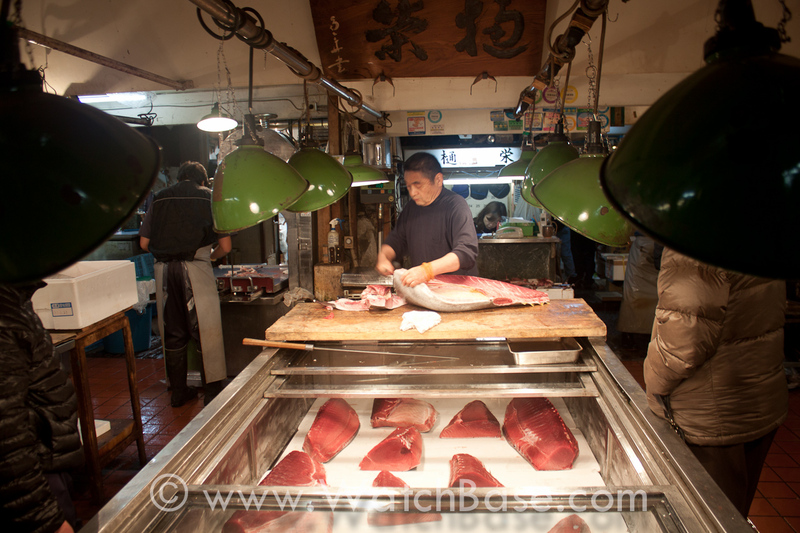 Earlier I wrote about Alon’s trip to Japan, of which the first part can be read here. Shortly after my post he sent me another batch of pictures with a stellar and vibrant report. 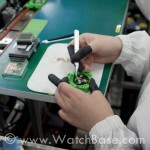 Today I found some time to put it up, so sit back and enjoy Alon’s trip to Casio HQ! After visiting the Premium Production Line of Casio in Yamagata on Tuesday, we spent Wednesday exploring Tokyo and learning about the Japanese culture. The main focus was to learn why Japanese are so innovation-driven, like was the case for the Kashio Brothers, the founders of Casio Computers Corporation, Ltd. In 1946, Tadao Kashio founded a company called Kashio Seisakujo, in Mitaka, Tokyo. One of his earliest innovations was some kind of ring that held a cigarette, allowing its wearer to smoke the cigarette until its very end – with Japan impoverished from WWII, this innovation was quite a success. Tadao Kashio, now joined by his brothers Toshio, Kazuo and Yukio, would go on and invest the proceeds in the development of electronic calculators, of which the first prototype was shown by in 1954. In 1957 the first commercially available electronic calculator was introduced by the company, at which time Casio Computer Co., Ltd. is established. 2. Edifice (Focus on Speed & more elegant designs). 3. 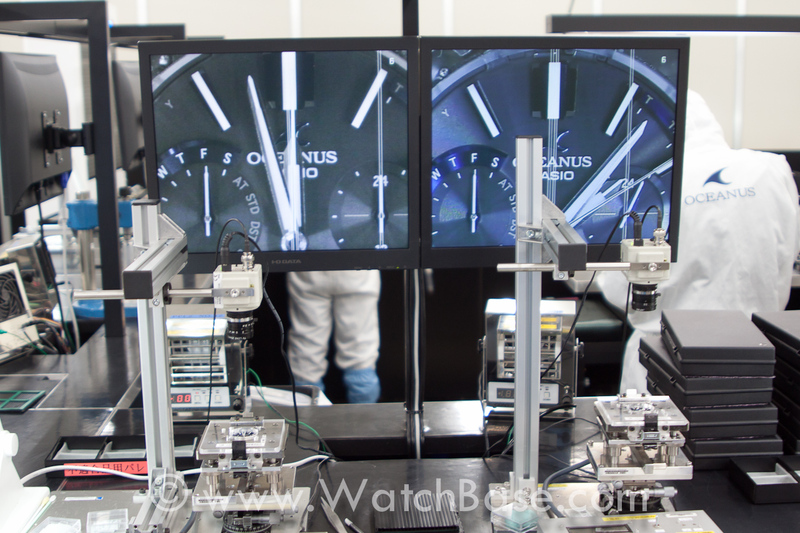 Oceanus (Top range of most advanced steel technology watches). 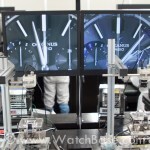 So, the first question that comes to mind is why Casio makes watches of EUR 19, G-Shocks starting at EUR 99 and then moves up to EUR 999?, with the Premium MR-G watches and Oceanus watches even reaching well over EUR 2.000? 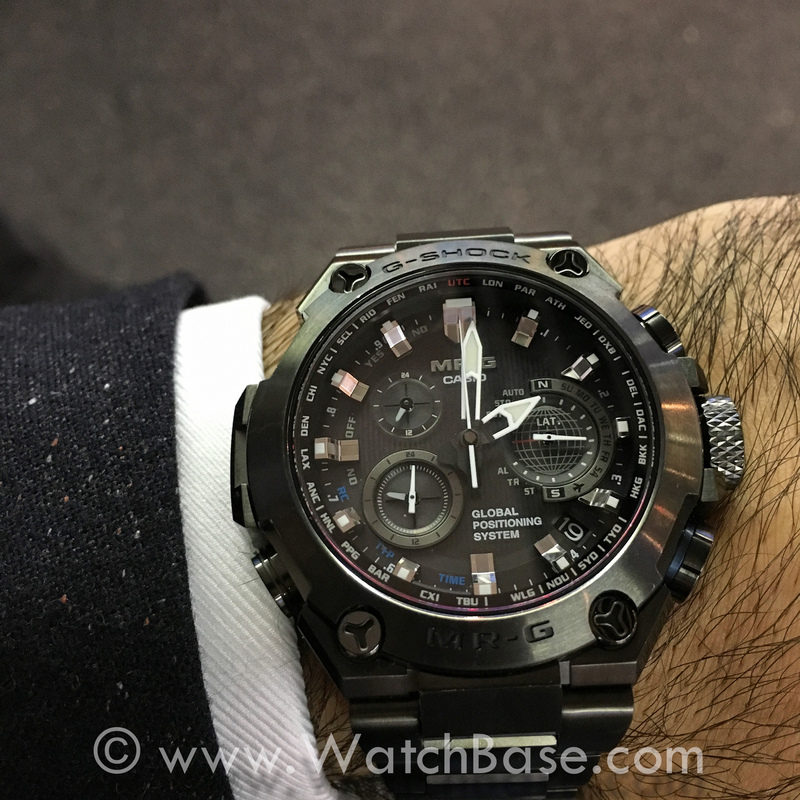 We will answer this question by quoting watch expert, Gerard Nijenbrinks, on a wrist shot of the MR-G black DLC titanium watch: “It’s really a pity that many people omit to do research on this type of G-Shock product. The build quality, technical features and innovations in this product absolutely don’t do it justice as referring to it as any G. Of course there are G’s at 1/10th of the price, however there are Mercedes-Benz’s for 30k and for 300k as well…” We could not have given a better answer. 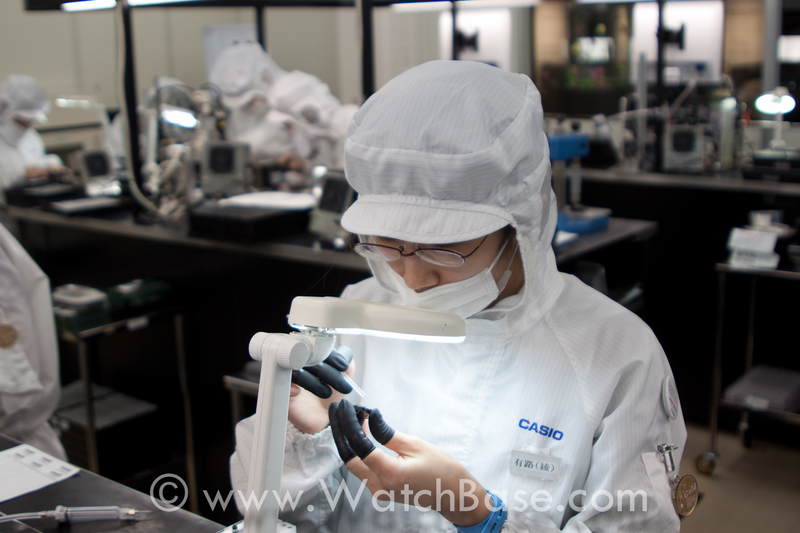 So, rests us to analyze what does quality mean for Casio, what technical features do they offer and what innovations do they present? We can’t exist without history. 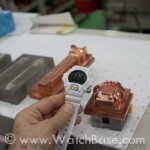 The history of G-Shock starts with living watch guru: Mr. Kikuo Ibe. In 1983 his brain child, the Casio G-Shock, was introduced. Its importance can hardly be exaggerated: until this point in time, most watches were still rather fragile objects, whereas the G-Shock was designed to withstand a fall from 10 meters, have a 10atm (100m) water resistance and have a 10-year battery life – the so-called Triple 10 Criteria. The development of the G-Shock was in-line with Casio’s credo: “creativity and contribution.” It expresses the company’s commitment to contributing to society by offering the kind of original, useful products that only Casio can. 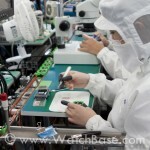 The Casio Code of Conduct is the essential guide for the daily work of all Casio employees. They summarize this in the slogan: Something from Nothing = 0 > 1. Or, in full: ‘ We will develop and provide products and services beneficial to society based on our creation-oriented mindset to create new value from nothing, or by going from “0” to “1”, and contribute to the development of a sustainable society in the process‘. This was all explained to us today by Mr. Horishi Nakamura, Senior Executive Managing Officer, Member of The Board, Senior General Manager and Global Marketing Headquarters. Mr. Nakamura welcomed us in both Dutch, German and English, as he lived for almost two decades in Europe. 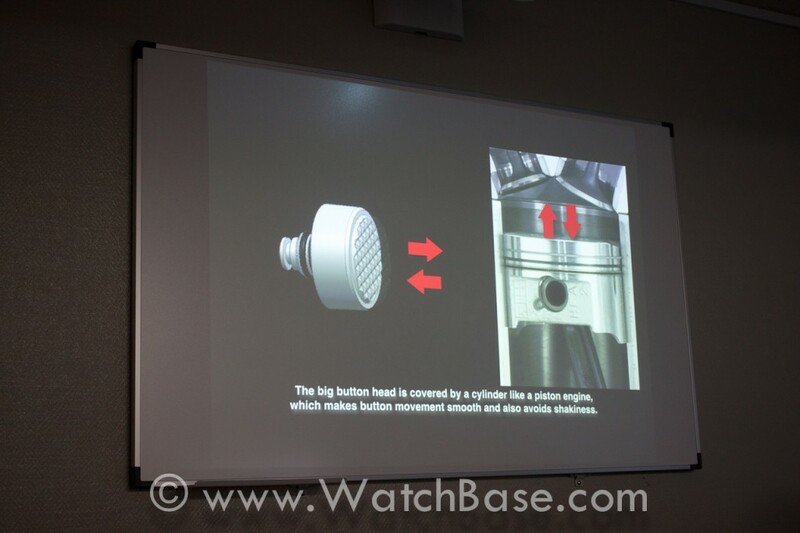 After his presentation of the history, present state and future developments of the company and the watch branch, he introduced us to Mr. T. Morishima, Head of Design of G-shock. 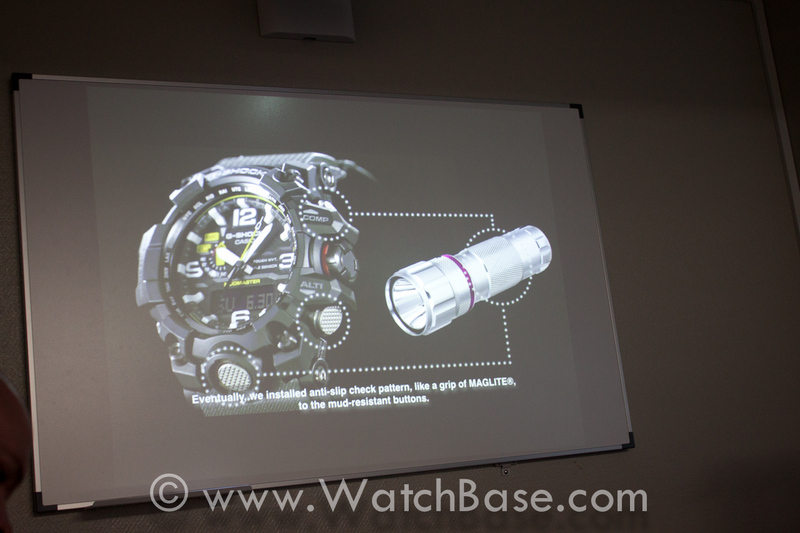 Mr. Morishima explained, which we summurazed to: basically G-Shock always followed the Form-Follows-Function philosophy. 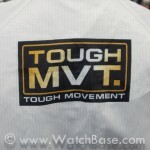 It was born out of necessity for though, shock-proof watches. Like Land Rover Defender cars. 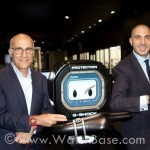 Not a coincidence that both Dale and me are mad about Defender cars AND G-Shock watches! He explained that Casio educates all in-house designers internally and give them a lot of freedom to grow and experiment. Inspiration is drawn from a wide array of fields – professional equipment, the automotive industry, urban culture and much more. They always draw a rough sketch by hand, then redraw it in a better-quality drawing and finally redraw it digitally in CAD. 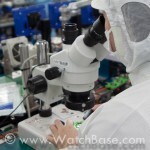 And, they are non-stop in pursuit to innovate and make watches more robust. 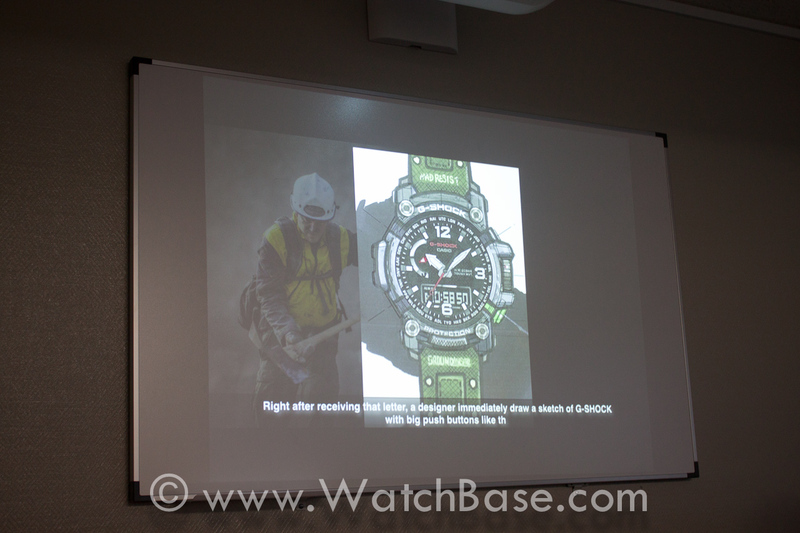 He explained how they came to develop the Mudmaster: a fire figher, who is a great G-Shock fan, wrote to Casio he always works with gloves in muddy surroundings in the mountains and he needs bigger pushers. 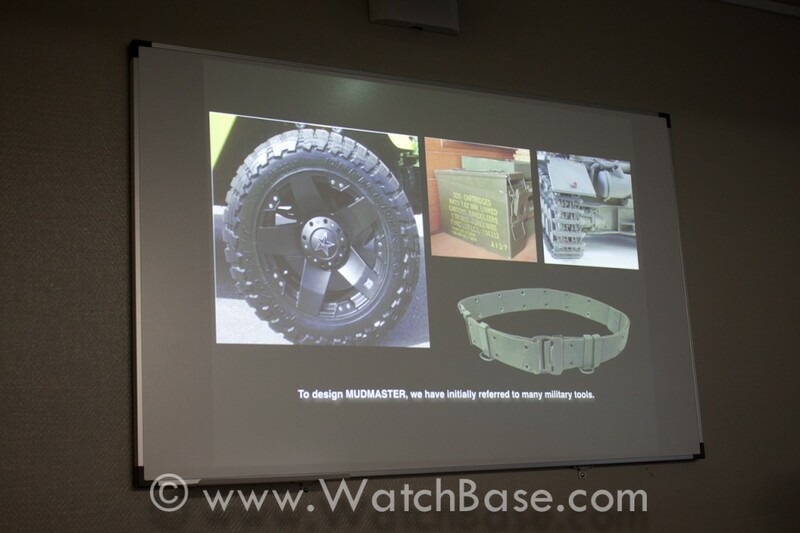 Hence the very charismatic Mudmaster which was launched earlier this year. 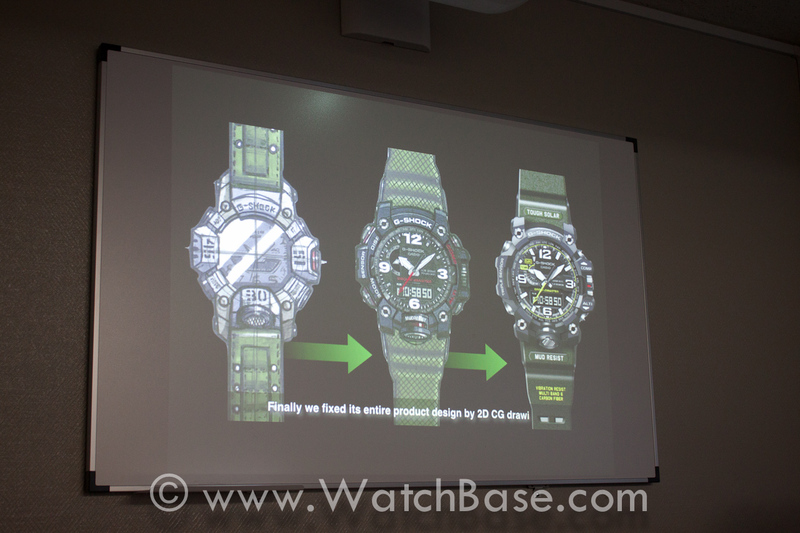 Then there as time for a full length, no restrictions Q&A will all Casio representatives present. 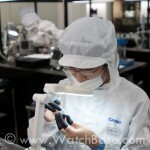 The question that is asked often is, why Casio never has created any mechanical watches and if they are planning too. The answer is rather simple in Casio’s corporate strategy: historically they are a technology company and not watchmakers. There is the desire to grow and evolve in the timekeeping sector by innovation and precision (of timekeeping). 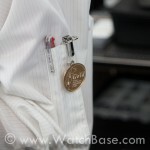 As such, mechanical watches do not fit this strategy. Another question was of all designers and design come from within or do they work with freelancers and do they outsource design. That answer was very short & simple: They don’t. Everything is done in-house! After some brainstorming about education of retailers about the products the visit came to an end and we were all invited to a traditional Japanese restaurant in the neighboring Opera Tower. There we had a surprise guest waiting for us: Mr. Etsuro Nakajima, who retired this very day. Yes, this was his last day at Casio after working there 39 years, where he started at the age of 23. He spent all his working life thus far at Casio, with his last official title being Senior Manager of Module Development Department of Timepiece Devision at Hamura R&D Center. As most Japanese do not retire and sit still, Mr. Nakajima starts tomorrow at his ‘new job’ as Representative Director of The Horlogical Institute of Japan. 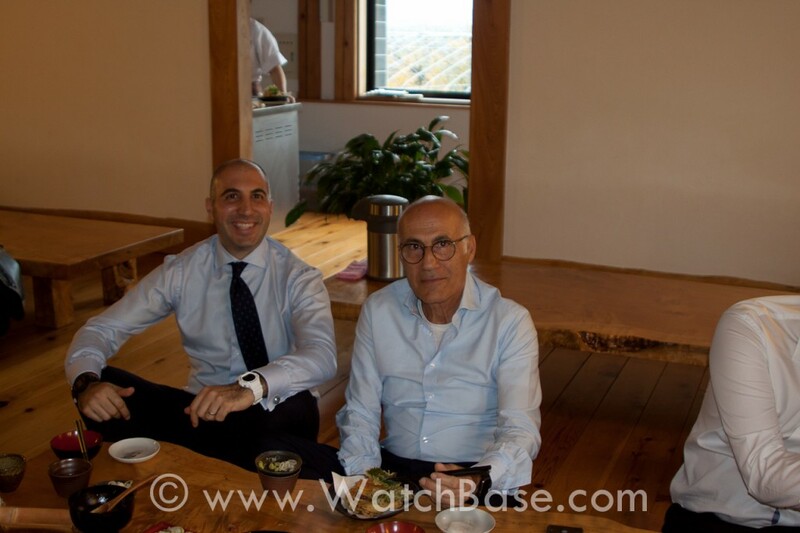 We had the honor to speak to him for several hours and he is very open, friendly and full of knowledgde of the complete international watch industry. He committed to do an exclusive interview with WatchBase. Stay tuned for the full interview! Interested in Alon’s other impressions of Japan? Read them on his blog. When Alon first told me he and his dad David would be flying out to Japan for a Casio factory visit courtesy of Casio Europe, I could tell he was VERY excited. Having joined him on numerous occasions to similar trips to Switzerland, I know for a fact he very much enjoys to meet the people behind the brands, to see their factories, and to hear their stories. And now Casio? To say he was looking forward to his first visit to Japan would be an understatement. 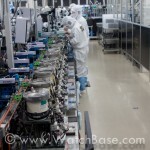 Yesterday Alon sent me the first two batches of pictures he took, along with a summary of his impressions. In the post below you’ll find my transcription of these files. 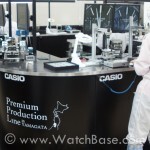 A couple of weeks ago we [Ace Jewelers & Watchbase] were invited by Casio Europe to join a small group of retailers for a factory visit in Japan. The group consisted of a total of 8 people: 1 Swedish Casio Authorized Dealer, 1 Austrian Casio AD, 4 German retailers, and us. The invitation both surprised and humbled us, as with Ace Jewelers we just stopped with Casio as we decided to close the boutique that carried it. So here we are, a few weeks later. Last Monday me and my dad flew out to Tokyo and joined to other members of our group, who all flew in from their home countries. Jet-lagged and all, we were all rather happy our welcome in Tokyo was very relaxed. For dinner we joined the head of Casio Europe at a nice Tempura restaurant. Day 2 our group was joined by Fujimoto-San (Mr. Hiroshi Fujimoto, Manager Europe & North America Section, Timepiece Department, Overseas Marketing & Sales Division), Takeuchi-San (Mr. Yasushi Takeuchi, Assistant Manager Europe & North America Section, Timepies Department, Overseas Marketing & Sales Division), plus the Sales Manager Europe (Marc), the Managing Director Benelux (Suzuki-San) and Sales Manager the Netherlands, Erik Velthoven. We set off to Yamagata, which is a three hour trip by train from Tokyo. The mountainous Yamagata prefecture is primarily known for its fruit, among which the best cherries of Japan, apples and pears – and skiing. However, what struck me were the similarities to Switzerland, where in days gone by farmers used to be cut-off from the rest of the world with plenty of time to hone their skills in precision manufacturing. As such, it was hardly surprising that this area -according to our hosts- is often seen as a mini-Silicon Valley in Japanese style, especially when the good infrastructure and kind weather conditions are taken into account. Upon arrival in Yamagata we were treated to a traditional Japanese-style lunch, after which we were invited to the factory. 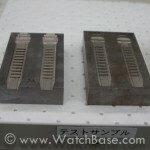 Third party plastic parts (moulding & injection). 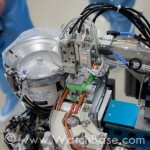 Something I found particularly interesting and impressive was the fact that Casio made all machines, robots and tooling in the factory themselves. 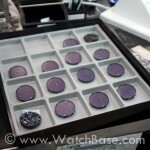 All parts are created fully in-house, both with case as well as movement production. Being a fan of all types of watches you can imagine, I of course had to ask: how about mechanical movements? Well, they never made one nor do they intend to do so: their focus will remain on precision timekeeping and long-term durability. 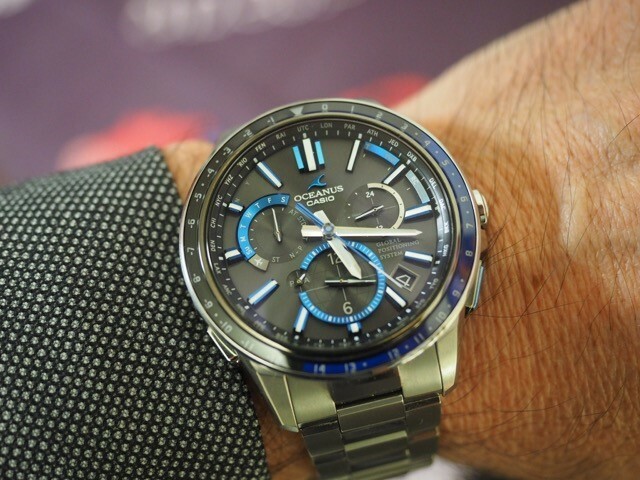 Some 7 years ago Casio decided to further up the quality its watches, and as such high-end collections like the Mr. G, MT-G, Mudman, Oceanus and watches with GPS synching are now produced in Yamagata – with a considerable and unsuspected amount of hand-work that is! SS: Meister – an additional year of experience. There are not yet any Meisters though, as this programme is not ‘live’ long enough to have any of the employees complete the 7-year training. 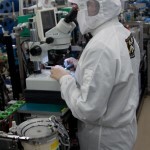 A number of the people trained at Yamagata will eventually move to Thailand and China and guard and improve the quality of Casio production at the local factories. 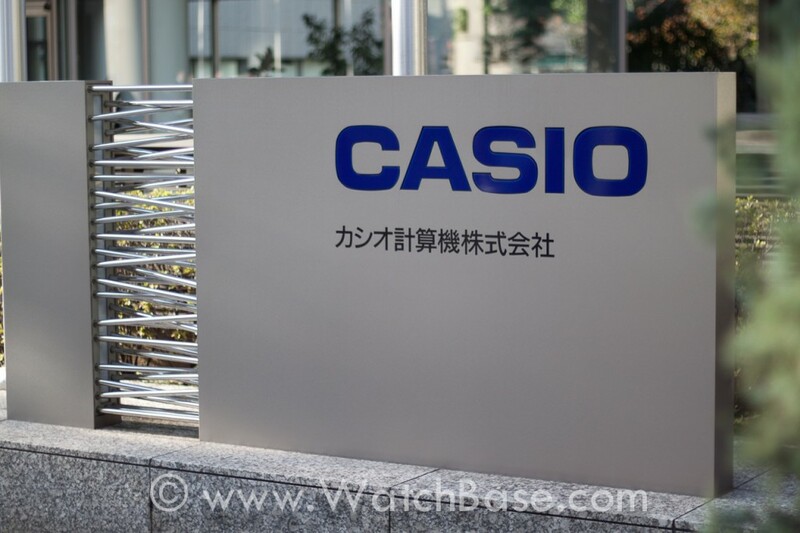 Last but not least – in about 7 weeks Casio will make some kind of announcement regarding an intelligent watch.. Having seen the manufacturing power and expertise of this Japanese giant first hand, I can’t wait to see what it is! In celebration of the Gay Pride that’s taking place in our city of residence (Amsterdam) this weekend, we’re kicking off today with few G-Shock uploads to bring a bit of color to WatchBase. Casio G-Shocks have long been my favorite watches for sports, especially the iconic ‘squares’ like the 5600 and 5000 series. The collectors community behind these is very much alive and thriving too, and theirs a wealth of information to be found online. 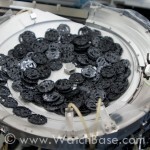 Two of my favorite resources are the WatchUSeek ‘F17’ G-Shock forum and the 50 G’s Blog by my friend Sjors. As much as I love (vintage) mechanical watches, I’m very much looking forward to adding more G-Shocks to our database!